Privately funded family of solid propellant satellite launch vehicles. 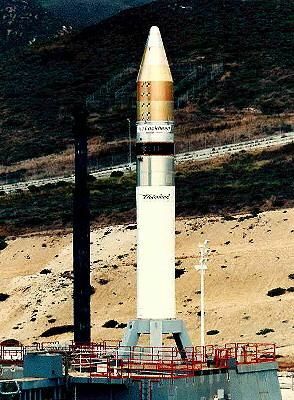 Originally known as LMLV (Lockheed-Martin Launch Vehicle); LLV (Lockheed Launch Vehicle). Sales did not develop as hoped by the company after the MEO-satellite bubble burst in the 1990's. Gross mass: 7,300 kg (16,000 lb). Height: 15.24 m (49.99 ft). Diameter: 0.79 m (2.59 ft). Apogee: 200 km (120 mi). Athena-1 American all-solid orbital launch vehicle. Basic version of the Athena with a Castor 120 first stage, Orbus second stage, and OAM Orbital Adjustment Module. Athena-1c American orbital launch vehicle variant. Athena-2 American all-solid orbital launch vehicle. The Athena-2 version featured a Castor 120 first stage, Castor 120 second stage, Orbus third stage, and OAM Orbital Adjustment Module. Athena-2c American orbital launch vehicle variant. Athena-3 American all-solid orbital launch vehicle. Planned but never flown heavier-lift version of Athena. Country: USA. Spacecraft: Oscar, SSTL-70, GemStar, Athena Mars Flyby, Lewis satellite, Lunar Prospector, ROCSAT, Ikonos, Starshine, Sapphire. Launch Sites: Cape Canaveral, Vandenberg, Kodiak. 1995 August 15 - . 22:30 GMT - . Launch Site: Vandenberg. Launch Complex: Vandenberg SLC6. LV Family: Athena. Launch Vehicle: Athena-1. 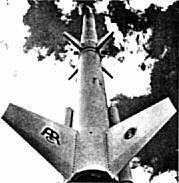 FAILURE: Destroyed by range safety 160 sec into flight after failure of thrust vector control system.. Failed Stage: 2. GemStar 1 (VitaSat) - . Payload: Gemstar DSS-1. Mass: 113 kg (249 lb). Nation: USA. Agency: LMSC. Class: Communications. Type: Civilian communications satellite. Spacecraft: GemStar. Decay Date: 1995-08-15 . Global Electronic Messaging Satellite..
1996 During the Year - . Athena Mars flyby mission proposed - . Nation: USA. Spacecraft: Athena. Unlike previous fly-by concepts, Robert Zubrin's Athena would remain in the vicinity of Mars for a year while the crew remotely operated probes of the Martian surface and atmosphere..
1998 January 7 - . 02:28 GMT - . Launch Site: Cape Canaveral. Launch Complex: Cape Canaveral LC46. Launch Pad: SLC46. LV Family: Athena. Launch Vehicle: Athena-2. Lunar Prospector - . Payload: Discovery 3. Mass: 295 kg (650 lb). Nation: USA. Agency: NASA Ames. Manufacturer: Lockheed. Program: Discovery series. Class: Moon. Type: Lunar probe. Spacecraft Bus: LM-100. Spacecraft: Lunar Prospector. Decay Date: 1999-07-31 . USAF Sat Cat: 25131 . COSPAR: 1998-001A. The Lunar Prospector was designed for a low polar orbit investigation of the Moon, including mapping of surface composition and possible polar ice deposits, measurements of magnetic and gravity fields, and study of lunar outgassing events. Data from the 1 to 3 year mission will allow construction of a detailed map of the surface composition of the Moon, and will improve understanding of the origin, evolution, current state, and resources of the Moon. After launch, the Lunar Prospector had a 105 hour cruise to the Moon, followed by insertion into a near-circular 100 km altitude lunar polar orbit with a period of 118 minutes. The nominal mission duration was one year. 1999 April 27 - . 18:22 GMT - . Launch Site: Vandenberg. Launch Complex: Vandenberg SLC6. LV Family: Athena. Launch Vehicle: Athena-2. FAILURE: Payload shroud failed to separate four minutes after launch.. Failed Stage: S.
Ikonos 1 - . Mass: 726 kg (1,600 lb). Nation: USA. Agency: Martin. Class: Surveillance. Type: Civilian surveillance satellite. Spacecraft Bus: LM-900. Spacecraft: Ikonos. Tracking stations downrange did not pick up the spacecraft. It was later determined that the rocket nose fairing failed to separate four minutes after launch. The extra mass caused the vehicle to reenter over the South Pacific on the first partial orbit. Space Imaging's Ikonos 1 was to have been the first commercial imaging satellite with a high a resolution camera. 1999 September 24 - . 18:21 GMT - . Launch Site: Vandenberg. Launch Complex: Vandenberg SLC6. LV Family: Athena. Launch Vehicle: Athena-2. Ikonos - . Mass: 726 kg (1,600 lb). Nation: USA. Agency: SpaceIm. Manufacturer: Lockheed. Class: Surveillance. Type: Civilian surveillance satellite. Spacecraft Bus: LM-900. Spacecraft: Ikonos. USAF Sat Cat: 25919 . COSPAR: 1999-051A. Apogee: 679 km (421 mi). Perigee: 678 km (421 mi). Inclination: 98.10 deg. Period: 98.30 min. Commercial / civilian high resolution (1 metre resolution) photograhic satellite..
2001 September 30 - . 02:40 GMT - . Launch Site: Kodiak. LV Family: Athena. Launch Vehicle: Athena-1. Starshine 3 - . Mass: 67 kg (147 lb). Nation: USA. Agency: USAF. Class: Earth. Type: Geodetic satellite. Spacecraft: Starshine. Decay Date: 2003-01-21 . USAF Sat Cat: 26929 . COSPAR: 2001-043A. Apogee: 472 km (293 mi). Perigee: 472 km (293 mi). Inclination: 67.00 deg. Possibly last Athena flight. Launch delayed from September 1, 18, 22, 23, 25, 28. This was the first orbital launch from Alaska's Kodiak Island launch site (Foul weather and auroral conditions had delayed the launch many times) . The Lockheed Martin Athena-1's Orbit Adjust Module's (OAM) four MR-107 hydrazine engines fired for 12 minutes to put the payloads in a 237 x 815 km transfer orbit. After a coast to apogee above East Africa, a second burn at 0337 GMT circularized the orbit. USAF Space Test Program satellites Picosat, Sapphire and PCSat were deployed into an 790 x 800 km x 67 deg orbit between 0344 and 0352 GMT; the OAM then made a perigee lowering burn to a 470 x 800 km orbit. Another burn half an orbit later put OAM in a 467 x 474 km orbit, from wish Starshine 3 was deployed. Finally, the OAM made a perigee-lowering depletion burn which left in a 215 x 403 km x 67.2 deg orbit from which would reenter in a few months. Starshine-3 was a 90 kg, 0.9 m geodetic sphere that was to be observed by students. The NASA satellite was basically a passive light-reflecting sphere, consisting of 1,500 student-built mirrors (polished by kindergarten and grade school students from many countries) and 31 laser "retroreflectors". A few solar cells provide enough power to send a beacon at 145.825 MHz every minute. Ham operators around the world were expected to obtain signal strengths from which the decay (due to magnetic torque) of its spin rate could be determined. The project was managed by NASA GSFC and Starshine was built by the Naval Research Laboratory. PCSat - . Mass: 67 kg (147 lb). Nation: USA. Agency: USN. Class: Communications. Type: Amateur radio communications satellite. Spacecraft: Oscar. USAF Sat Cat: 26931 . COSPAR: 2001-043C. Apogee: 796 km (494 mi). Perigee: 789 km (490 mi). Inclination: 67.00 deg. Period: 100.70 min. PCSat (Prototype Communications SATellite) was to act as a relay for UHF/VHF amateur radio transmissions. It was built by the midshipmen at the US Naval Academy. It was to augment the existing worldwide Amateur Radio Automatic Position Reporting System; mass was around 10 kg. Picosat - . Mass: 67 kg (147 lb). Nation: USA. Agency: USAF. Manufacturer: Surrey. Class: Technology. Type: Navigation technology satellite. Spacecraft: SSTL-70. USAF Sat Cat: 26930 . COSPAR: 2001-043B. Apogee: 795 km (493 mi). Perigee: 788 km (489 mi). Inclination: 67.00 deg. Period: 100.70 min. STP P97-1 Picosat was built by Surrey Satellite for the USAF using a Uosat-type bus. The 68 kg satellite was to test electronic components/systems in space conditions. It carried four test payloads: Polymer Battery Experiment (PBEX), Ionospheric Occultation Experiment (IOX), Coherent Electromagnetic Radio Tomagraphy (CERTO) and an ultra-quiet platform (OPPEX). Called Picosat 9 by some Agencies although not related to other satellites in that series. Sapphire - . Mass: 67 kg (147 lb). Nation: USA. Agency: Lockheed. Manufacturer: Stanford. Class: Technology. Type: Navigation technology satellite. Spacecraft: Sapphire. USAF Sat Cat: 26932 . COSPAR: 2001-043D. Apogee: 796 km (494 mi). Perigee: 790 km (490 mi). Inclination: 67.10 deg. Period: 100.70 min. SAPPHIRE (a US DoD-funded microsatellite) was built by Stanford University students and carried experimental infrared horizon sensors, a voice synthesizer and a digital camera. The satellite was about 0.5m in size and had a mass of 16 kg..